On *13th April 1978*, 13 great souls attained martyrdom (Shaheedee). 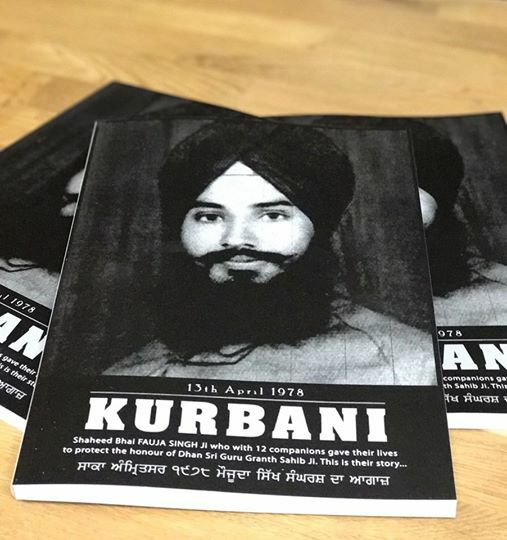 To tell their spine chilling stories, *"Kurbani"* (named after Bhai Fauja Singh Ji's poem), was produced and distributed as a booklet over 20 years ago. A dedicated team has now re-created this book with a worldwide release on the 13th April 2017. The book will be available during the *Akhand Kirtani Jatha UK International Smaagam* taking place in Derby 9th - 17th April. It will also be available at many other Nagar Kirtans and Gurdwara stalls worldwide.